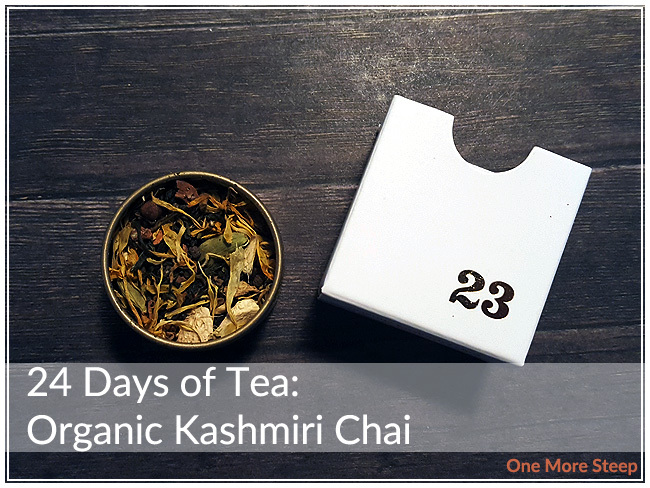 Getting near the end and day 23 is Kashmiri Chai! One of my first tea loves from my undergrad was indulging in Chai lattes from one of numerous Starbucks on campus. The sweet and spicy scent profile from DavidsTea’s Kashmiri Chai reminds me a lot of the Starbucks Chai latte, just with a stronger punch of spice fragrance to it. The cardamom, clove, and cinnamon are the most obvious, with slight hints of the green tea base lingering in the background. Organic Kashmiri Chai is a mix of: green tea, cinnamon, cardamom seeds, ginger, cardamom husk, clove buds, and marigold flowers. The mix (according to the packaging) is kosher. DavidsTea recommends steeping Organic Kashmiri Chai in hot water (75-80°C/167-176°F) for 3 to 5 minutes. I steeped my first cup for 3 minutes. While I was steeping the Organic Kashmiri Chai, I couldn’t help but notice that there were a lot of fine dusty tea particles that didn’t get caught by the stainless steel infuser that I was using. I’m not sure if that’s just because of what I got in my little calendar tin, but I would consider using a filter bag in the future to avoid that. The level of spicy flavour in this Kashmiri Chai are divine. I love the heavy taste of cinnamon, cardamon and cloves. 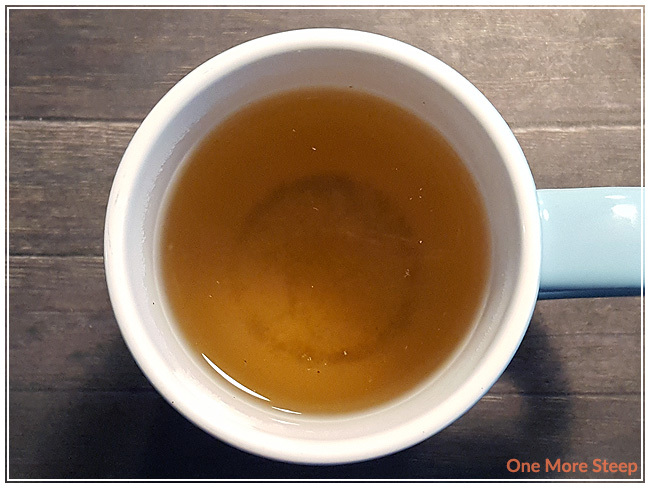 The green tea just acts as a base and I can just barely taste it – but that’s really okay with me because the warming spices are just a delight in my cup. There is a level of sweetness to this tea that is nice, I think it could benefit a lot from having the addition of a sweetener. 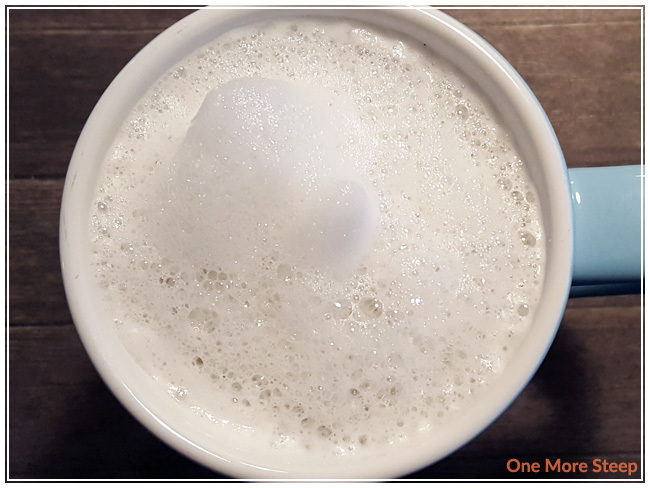 Because I’m a fan of Chai lattes, I opted to make it into a latte as well (my tutorial on making lattes at home here!) and it is delicious! I think I want to try steeping this particular tea in milk in the future, like how traditional Chais are done, to see how it holds up flavour wise. Organic Kashmiri Chai does well with one more steep. The heat from the ginger is more prevalent in the second steep, with the cinnamon and cardamom taking a back seat. Overall, I think a maximum of two steeps is good for this tea. 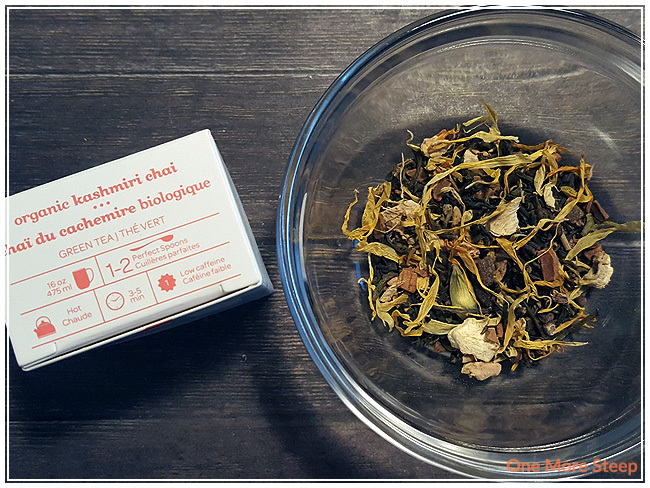 I loved DavidsTea’s Organic Kashmiri Chai. From the warming sensation of the spices to the way the tea works deliciously well as a latte, I really enjoyed the Kashmiri Chai. I think that the level of sweetness and spiciness works well, and it translates into a great cup of tea that I would buy to have some in my tea stash. 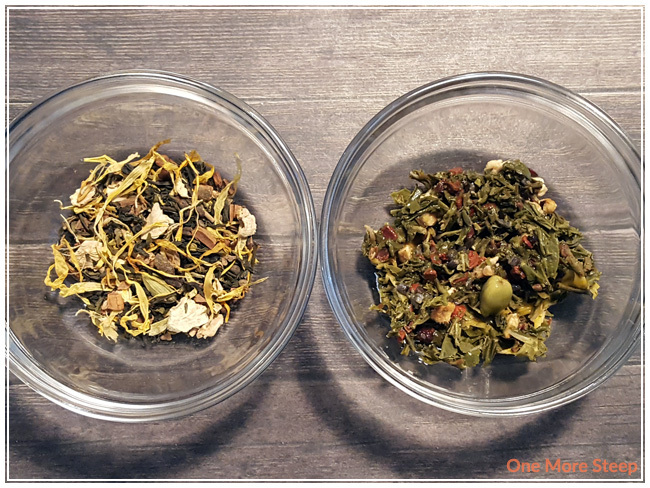 Your presentation of the dry and infused leaves is one the features I enjoy about your blog posts.